In an abandoned warehouse, a band of gangsters is splitting their latest haul, but they can't come to an agreement on the split. It's time to let the guns do the talking, and soon everyone is aiming at everyoneâ€¦ All you have to do is stay alive and have the most money at the end of the game! CA$H'n GUN$ will make you relive the best scenes from gangster movies and other modern detective stories, where the flimsiest excuse serves to let bullets fly! Fun, bluff and negotiations are to be had. Thing is, do you have enough guts to play? 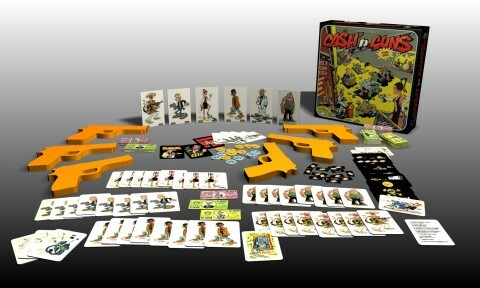 CA$H'n GUN$ is a game for 4 to 6 players. A great party game where you can not escape staring down the barrel of a gun at some point. The question is if you've got the guts to see if they're bluffing. It also comes with fun variants where you can have special powers or where there's an informant amongst the criminals. This game is a blast with the right group, the short playing time means that you will end up playing it several times in a row. If you are good a bluffing and negotiation this is the game for you. OK, you POINT (foam) GUNS AT PEOPLE. Do I have to spell it out? This is a great cathartic game to play with folks who love a lot of interaction. Load your gun (or use one of your many blanks), point your gun, and ask... Do you feel lucky, Punk? As I initially read about this game, I was a little put-off by the idea of pointing guns at other people (regardless is whether they were foam or not!). I finally got a chance to play the game and have to say that I have completely changed my mind on this game and have since purchased it for myself. This game is a laugh-riot, and while I might not suggest that you play this with your children, it is a great bluffing/press-your-luck style game with tons of interaction. Give it a try before you buy if you are worried about the "theme" as I was, but I will guess that you'll find a good time with this game. Despite the controversial theme, I find this game to be a comical and tense social game that quickly draws everyone into character as they try to secure the most loot. Nice game for groups that don't mind hassling each other on occasion! Great mindless fun. Point, threaten, and shoot. Try to be left standing. The extra powers variant is a lot of fun. Cash&Guns is a party game that I'd recommend to any fan of movies like the Goodfather or Reservour Dogs. It's a game of bluffing and role playing and can be an amazing experience with a group of committed players. Cash&Guns creates the kind of atmosphere and sessions that you remember and talk about - even years after.